Every girl wants to be perfect, but that is not possible. You need to have all best features, which nobody really has and one of them is having rosy cheeks. Having rosy cheeks makes you look fresh, young and beautiful. Makeup makes us achieve this to a large extent but once it is off then you are back to square one. 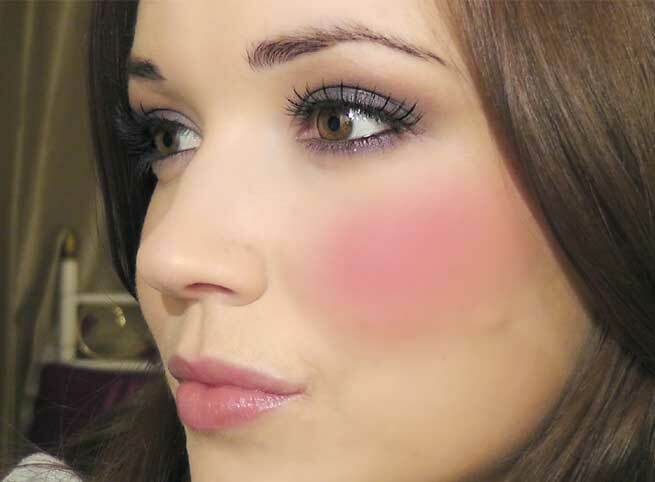 Is it possible to get rosy cheeks naturally without any makeup? Let us find out. 1. Check your diet: Diet is very important to get rosy cheeks. Say NO to all kind of junk food and include a lot of fruits, sprouts and leafy vegetables in your diet. Take meals at regular intervals in small quantity. Avoid red meat instead include fish as well as chicken in your diet. Sprouts are good source of proteins. 2. Rinse your skin: Rinsing the face with warm water is said to help us in getting rosy cheeks. Warm water flushes the skin thereby making it look pink. 3. Facial massage: Massage is a very good method to get rosy cheeks. The massage has to be done in circular motion. This will help in increasing the blood flow of the cheeks and thus make it rosy. 4. Exercise: Exercise is very important to get rosy cheeks. You must engage in some kind of exercises regularly. When this happens your body remains fit and the mind and soul is at peace. This happiness will reflect in your skin too. 5. Hydrate yourself: Hydration is very important to have a good skin. When you drink adequate water on daily basis, it makes your skin glow and cheeks rosy. At least 8 glasses of water is supposed to be consumed daily. 6. Exfoliate the skin: To make your cheeks rosy naturally exfoliation is very important. Exfoliate your skin 2 times a week and you will notice that your cheeks will start to glow with a rosy tint. 7. Use good fruit pack: Natural fruit packs do wonders to your skin. For getting rosy cheeks too these fruit packs help a lot. Any fruit that is red in color is great for the cheeks. You can try applying berry fruit pack concentrating more on the cheeks. 8. Beetroot: Beetroot has been used from ages to get rosy cheeks. You can use it in face packs or consume it daily. Beetroot is very good for the skin and it makes your cheeks rosy. 9. Vinegar: Vinegar is an excellent home remedy for rosy cheeks. Apply some vinegar on your cheeks with the help of a cotton plug. Keep it on until it dries and then wash it off. You have to do this remedy at least for a week to get the result. 10. Cucumber juice and lemon juice: Applying face pack of cucumber juice and lime juice milk with milk and honey will make your cheeks rosy. 11. Tomatoes: Take 2 tomatoes and make the juice of it. To that add 2 cups of water and 2 teaspoons of honey and blend it well. Have this juice early in the morning on an empty stomach. 12. Egg white and honey: Take an egg white of an egg, to that add one spoon organic honey and apply it on your face. Leave it for 10 minute and then wash it off with warm water. 13. Bananas: Bananas are great to achieve the rosy glow on your cheeks. Mash one ripe banana and make a paste of it. Apply this face pack on the face and leave it until it dries completely. Bananas are great for the skin. It renders a healthy glow to the skin and makes the cheeks rosy. 14. Milk and gram flour: Take 3 spoons of gram flour and add one spoon of milk cream to it along with 3 spoons of curd and wheat bran. Mix the ingredients well and apply it on the face for 20 minutes and then wash it off.